Being the younger sibling of Beyonce Knowles cannot be an easy feat. Beyonce’s commanding presence and power has allowed her to propel career from 90s band member to all-around triple threat, earning her multiple Grammy awards and lengthy roles in box office films. Beyonce’s repertoire is not only astounding but is also intimidating; however, throughout Beyonce’s career, sibling Solange Knowles has been able to emerge from the shadows into an established individual in the media. Like Beyonce, Solange’s claim to fame comes from multiple careers in the industry from releasing solo albums to starring in feature films. As audience members we have watched Solange make multiple transitions in her career, perhaps trying find her own claim to fame and avoid just being “Beyonce’s younger sister”. 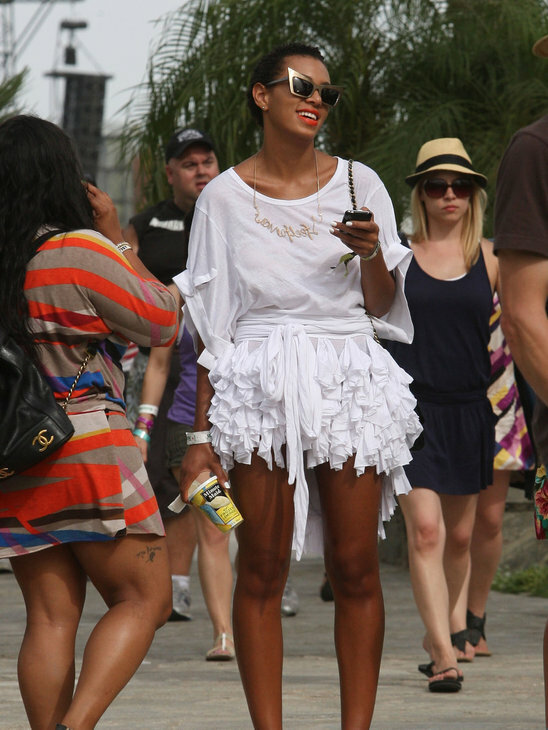 As Solange became more established in her career, her style began to reflected that allowing her to obtain a commanding presence in her own rite. This artist/DJ/tastemaker extraordinaire prefers rich hues, partial to canary yellow and corals, exotic prints, and stand-out accessories. Siting the Fela Kuti Queens as a source of sartorial inspiration, Solange’s incorporates an Afro-centric flair into each ensemble. I love how she is able to mix eye-catching graphics, color, and culture into each outfit. Sasha Fierce, she may not be; but when it comes taking sartorial risks, Solange takes them own perhaps making her the fiercest Knowles of them all.